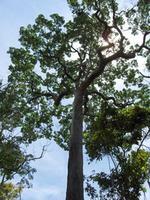 represent one of the most important non-timber forest products of extractivistic exploration in the Amazon region. The fruit pods are collected in the forest during the rainy season (from December to March/April) when they have fallen down from the wild and tall (until 60 m in height) trees (Bertholletia excelsa Humb. & Bonpl.) and chopped open to obtain the nuts in shell. Most of the collected Brazil nuts are then subject to minimal processing (selection, classification, cleaning, drying, shell cracking among the main processing steps) for export either in shell or shelled (as a kernel), mainly to Europe and United States of America. 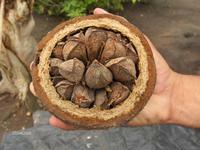 Bolivia is presently the largest Brazil nut producer and exporter, followed by Brazil and Peru. 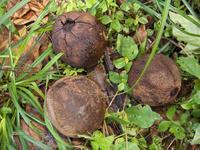 Nevertheless, the Brazil nut production chain is confronted with problems of contamination by aflatoxins, which are toxic secondary metabolites produced by Aspergillus flavus / A. parasiticus / A. nomius when the nuts are kept under conditions that favour the development of these fungi and toxin production. Such contamination is of major concern not only for public health because of the carcinogenic and genotoxic effects of aflatoxins in human beings, but also in regard to economic losses and environment impact. It constitutes the largest obstacle to Brazil nut commercialisation, especially in Europe where the regulation on aflatoxin levels has become very stringent since 1999 (4 ppb for total aflatoxins and 2 ppb for aflatoxin B1 for direct human consumption or use as food ingredient). Between 2000 and 2004, Brazilian exports of unshelled Brazil nuts, primarily to the European Union, fell by almost 90%. within the framework of STDF Theme 2: "Capacity building for public and private organizations, notably with respect to market access". Validate and transfer to the key stakeholders a sustainable and effective aflatoxin management system in the Brazil nut production chain for recovering and consolidating export markets, particularly in Europe. For more information, see Menu "Safenut project"